Using finger picks to play the guitar or any other stringed instrument like the banjo seems like a lost art at times. Nowadays fancy tapping, distortion pedals, and fast shredding seem to be all the rage. I still find the classic techniques important. For one, it’s never a good idea to skip the history of string techniques. Secondly, knowing the art of finger picking can give you quite an edge over other songwriters. But technique aside, if you’re going to stand out from the crowd you’ll need the best finger picks to fit your style, tone, and, of course, instrument. Finger picks are made from many different materials, but if you want to know what manufacturers deliver high-end quality each time, check out the following picks. Are All Finger Picks Interchangeable? 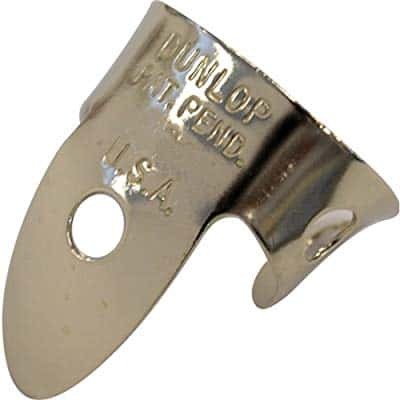 The Dunlop 33P series features finger picks in six sizes. You can choose a gauge between .013, .015, .018, .020, .0225, and .025 inches. This wide range allows you to use the Dunlop 33P for a variety of instruments. 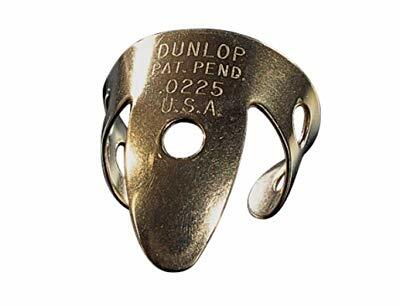 Of course, the most common use for these nickel silver finger picks is on banjos, acoustic guitars, and pedal steel guitars. The sound is bright as you would expect from Dunlop picks. If you’re new at using finger picks, this line is beginner-friendly as any. My suggestion would be to go with the .018 gauge as it is the standard metal thickness and offers a more neutral tone. And since you may be planning your first purchase, these are the more affordable finger picks on the market. It’s not a big deal if they don’t work out. Dunlop makes a wide range of musical instruments and peripherals. The 37R brass finger picks are popular among amateur and professional musicians. The gauge varies from .013 inches to 0.25 inches, although the .013s were a bit too flexible for my taste. The durability of the picks is without a doubt very good because of the full brass construction. If you’re looking for a classic tone, these might be your go-to finger picks. They work really well on guitars, banjos, pedal steel, and the situational but always fun resonators. The tone is interesting. While the 37R picks produce a distinct sharpness, the tone is accompanied by enough warmth and decent sustain. The sound is plenty crisp and you have enough attack on the strings to bring a classic tone to your modern music. It’s pretty much what you might need to enhance the quality of your tunes without resorting to a new instrument or digital effects. If you’re looking for some US-made brass finger picks, the National NP2B picks are also an option. These picks have been around since the 1930s, so they’re a nice choice if you want to go all-out vintage with your gear. They are available in a 4-pack, and the NP thumb pick can be purchased separately. In terms of sound quality, they’re quite neutral. Not only does this make them a decent choice for multiple playing styles, but it also makes them beginner-friendly. What makes them a solid choice in my view is the right measure of comfort, durability, and balance. It’s rare to find such an old design that still holds up to modern playing standards. Now, keep in mind that these picks only come in at .025 inches, so the gauge will limit the choice of instruments. They should work for a banjo, but if you’re an acoustic guitar player, you could expand your search unless you’re confident in your technique. 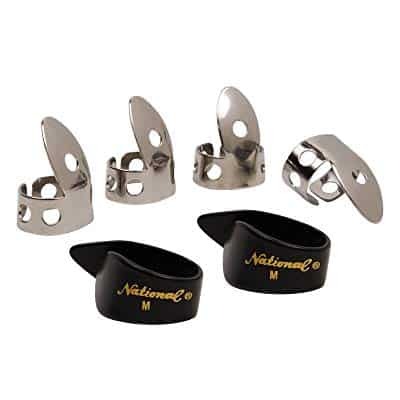 Leave it to National to spoil musicians with plenty of options when it comes to finger picks. The NP1-7B is a 6-pack which includes four NP1 finger picks and two NP7B thumb picks. Talk about value for the money. All the picks are made of stainless steel but only the finger picks retain the shiny grey finish. The thumb picks are painted and you can choose from three different colors. The tone is surprisingly neutral. Whether you’re plucking at high speed on a banjo or you’re accenting notes in a solo on an acoustic guitar, the NP1-7B gives you plenty of range. I also found these to be quite comfortable but it shouldn’t have been such a surprise considering the manufacturer. The grip is secure but not too tight, so you shouldn’t experience fatigue from wearing the picks. What sets these picks apart right off the bat is their versatility. I find the rounded design to be a lot easier to master and more interchangeable between instruments. 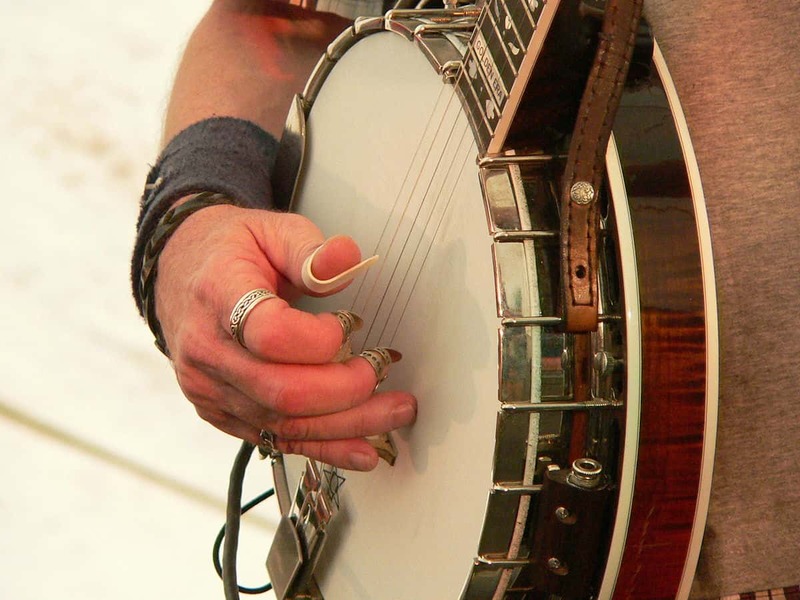 The transition between an acoustic guitar and a banjo is no joke for the average player. However, the neutral rounded design on these picks is nothing short of advantageous for newcomers. The same goes when switching from a standard vertical grip to playing flat on a steel guitar. If you’re looking for a more modern finger pick, Tone Deaf Music has you covered. 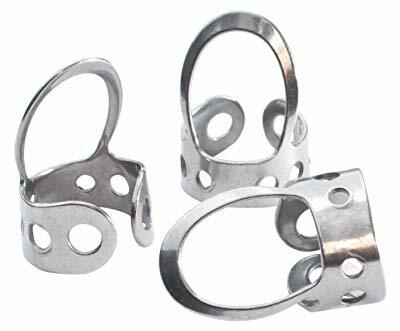 This design far from vintage and the use of stainless steel as casting material gives the picks much needed durability and consistency. Despite the rounded design, I found the tone to be quite sharp. So these might just be a solid choice if you want to combine a modern look with a classic sound. There is no gauge variety but the rounded design should eliminate a lot of potential issues. Furthermore, the ability to adjust the width gives you plenty to experiment with. 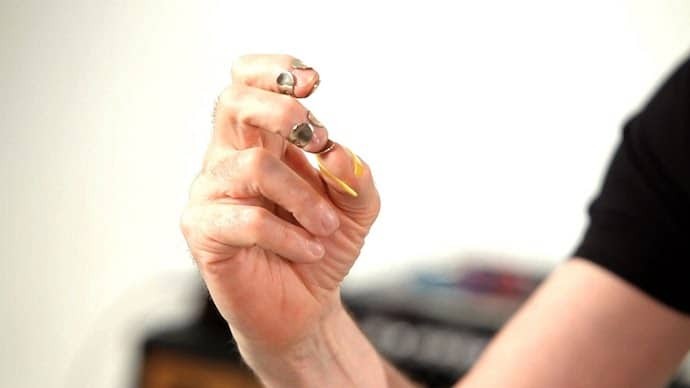 Finger picks give you a unique way to play string instruments like guitars, banjos, pedal steel guitars, etc. When evaluating finger picks, I always look at the materials first. 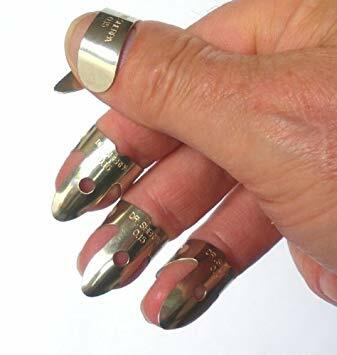 Metal finger picks will give me an aggressive tone. Composite finger picks are a lot mellower. The hardness of the pick is also important if you don’t want to ruin your strings. However, technique also plays a major role here, so don’t dismiss a finger pick because it’s too hard or too flexible until you actually try it. Not everyone needs finger picks. Even though these accessories aren’t generally expensive, you probably shouldn’t buy them unless you’re sure that you need them. Country and folk musicians can get a lot of use out of finger picks. Blues musicians not so much. If your licks sound more bluesy than country then you might want to consider a finger slide in order to enhance your sound instead of finger picks or thumb picks. The short answer is no. Some finger picks are designed to be a better fit for acoustic guitars than for banjos. Sometimes this has everything to do with the material, while other times it’s simply the gauge that determines the instrument of choice. Again, technique also matters. If you’re experienced enough, you may have perfect precision with a large finger pick on a banjo, or the control to use a hard finger pick on an electric guitar without cutting the strings. When shopping for finger picks, you don’t ever get just one. They’re almost always sold in packs. However, if you’re a true musician, you won’t just be using finger picks on stage or when recording. Therefore, eyeing a pack that includes thumb picks is not a bad idea if you want to get more value for the money. Also, sometimes getting multiple gauges and sizes is better than going for adjustable finger picks. Not all of those fare well when you constantly play with their width. If you’re looking for long-term solutions, you best be sure of the design quality and choice of material. Everyone tends to prefer a specific tone when using finger picks. I’m the same but I also like to dabble in multiple genres, hence the variation of tonality in my selection of finger picks. Depending on what type of music you play or what level of comfort you’re expecting, you may have different needs than me. However, the picks in this article cover pretty much every style and instrument you could want them for. Whatever you’re looking for, you’re bound to find at least two types of picks that suit you. Ever use any to chicken pick on a Tele? If so, suggestions? No idea about that, John.